Macaque monkey with tracking collar around its neck. Photos courtesy of Graham McGeorge. Ocala, Florida — “On Monday, Eleventh Hour For Animals filed a complaint with the USDA demanding a mandatory federal investigation into the secret and potentially illegal “research” conducted by the University of Florida on wild monkeys along the Silver River in Marion County, Florida,” Eleventh Hour’s Senior Lab Investigator, Karen Kline wrote in an e-mail. 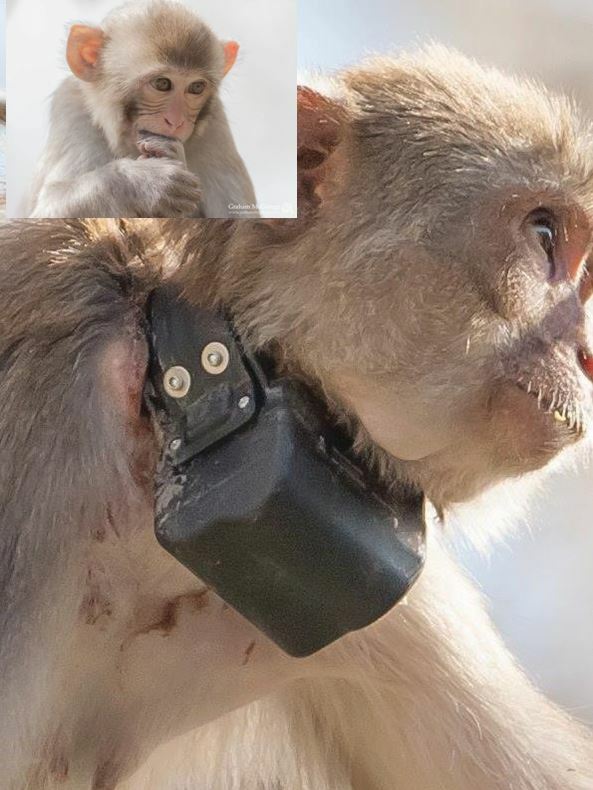 Exclusive images captured by Freelance Photographer Graham McGeorge and published by Ocala Post, depict a wild Macaque with a tracking collar device attached tightly around its neck. Kline said the university has been less than forthcoming about the exact nature of their interest in the Silver River Macaques. Therefore, Eleventh Hour has filed two open records requests to ascertain the details of the experiments as well as the source of funding. Additionally, the group filed a request with the Florida Fish and Wildlife Conservation Commission to secure all licenses that UF may have purchased over the last 10 years.